LASER TOOLS PROMOTION >JULY 18. TENG PROMO Ends Aug 2018. 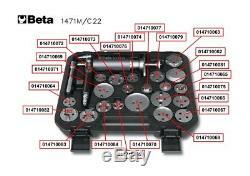 BETA TOOLS RACING ITALY PNEUMATIC AIR BRAKE PISTON WINDBACK & ADAPTOR TOOL SET. 1471M/C22 Pneumatic Tool for Pushing Back and Rotating Right and Left Disc Brake Pistons with Accessories in Plastic Case New assortment Automatic jack New assortment complete with all new adaptors Thrust: 150 kg Operating pressure 5&###xF7;8 bar Product Code 014710101. 50 Years experience of repairing vehicles we feel well qualified to trade within the automotive sector as a supplier of tools & equipment. This is where our business has the advantage over our competitors, we carry a large stock for immediate supply or the promise that non stock items can be dispatched within 48hrs. With having our own up to date workshops we have a wealth of experience & skill to advise on any questions we are asked , from technical data to how the items works. If we cannot answer the query we have many contacts and our 50 years experience in the business to find out the correct answers for you. You can add these instructions on to your checkout if preferred, in the Additional check out instructions section. Once goods have been delivered to you they will be held at your own risk and we will not be liable for their loss or destruction. We shall have no liability to you for any failure to deliver goods you have ordered or any delay in doing so or for any damage or defect to goods delivered that is caused by any event or circumstance beyond our reasonable control including, without limitation, strikes, lock-outs and other industrial disputes, breakdown of systems or network access, flood, fire, explosion or accident. Our acceptance of your order brings into existence a legally binding contract between us. Price 2.1 The prices payable for goods that you order are as set out in our website. You do not need to give us any reason for cancelling your contract. 3.2 To cancel your contract you must notify us in writing. 3.3 If you have received the goods before you cancel your contract then you must send the goods back to our contact address at your own cost and risk. Cancellation by us 4.1 We reserve the right to cancel the contract between us if: 4.1.1 we have insufficient stock to deliver the goods you have ordered; 4.1.2 we do not deliver to your area; or 4.1.3 one or more of the goods you ordered was listed at an incorrect price due to a typographical error or an error in the pricing information received by us from our suppliers. We will not be obliged to offer any additional compensation for disappointment suffered. 6.2 If you do not receive goods ordered by you within 10 days of the date on which you ordered them, we shall have no liability to you unless you notify us in writing at our contact address of the problem within 15 days of the date on which you ordered the goods. The importation or exportation of certain of our goods to you may be prohibited by certain national laws. Third party rights 11.1 Except for our affiliates, directors, employees or representatives, a person who is not a party to this agreement has no right under the UK Contracts (Rights of Third Parties) Act 1999 to enforce any term of this agreement but this does not affect any right or remedy of a third party that exists or is available apart from that Act. Governing law 12.1 The contract between us shall be governed by and interpreted in accordance with English law and the English courts shall have jurisdiction to resolve any disputes between us. Nothing said by any sales person on our behalf should be understood as a variation of these terms and conditions or as an authorised representation about the nature or quality of any goods offered for sale by us. Save for fraud or fraudulent misrepresentation, we shall have no liability for any such representation being untrue or misleading. Procedure to request an item return: 1. You may be asked to sign in. Next to your listing, select Return this item from the pull-down menu. The "Return an item" form appears. This listing is currently undergoing maintenance, we apologise for any inconvenience caused. 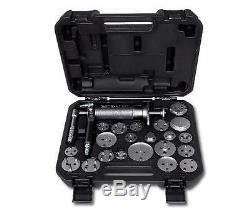 The item "BETA TOOLS RACING ITALY PNEUMATIC AIR BRAKE PISTON WINDBACK & ADAPTOR TOOL SET" is in sale since Friday, March 23, 2012. This item is in the category "Vehicle Parts & Accessories\Garage Equipment & Tools\Repair Tools & Kits\Brake Repair". The seller is "hardwick1982_on" and is located in Sutton-in-Ashfield.